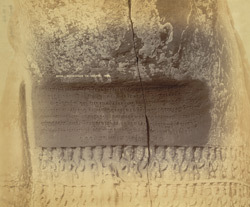 Photograph of the inscription incised on the chest of the large statue of a boar, Varaha, at Eran, taken by Henry Cousens in 1892-94. The town of Eran has been occupied from the second century BC onwards. It is located in a naturally defensible position, in a bend in the Bina river. Eran was an important site during the Gupta period and the pieces shown in this photograph were sculpted at that time. In the background there is a statue of Vishnu. This colossal boar statue (some 11 feet high and 13 feet long ) dates to the 5th century. It is completely covered with miniature carved figures. It represents Vishnu in his boar incarnation lifting the earth, represented as the goddess Bhu, on one of his tusks. The demon Hiranyaksha had pushed the earth under the waters and Vishnu saved it from being submerged. The Sanskrit inscription shown in this photograph refers to the reign of Toramana and it is dated in words to the first year of his reign. The object of this Vaishnava inscription is to record the building of the temple in which the Boar stands, by Dhanyavishnu, the younger brother of the deceased Maharaja Matrivishnu.